Among seniors who have arthritis or another disease that affects their mobility, it is common for them to have increased difficulty safely and independently interacting with their living environment. One common difficulty that many seniors have involves the task of standing up and sitting down. This often presents a problem for those with arthritis, but there are other diseases, which can also make this a more difficult task. In many cases, the difficulty that a senior has standing does not only increase their rsk of injury, but also that of their loved ones. For example, if someone must provide assistance each time they stand, their helper is at risk of increased injury. This is most seriously a problem among spouses who care for each other, as in this case, since both the senior and the care taker have limited mobility, both seniors are at an increased risk of injury. To help make it easier for a senior to independently stand and sit, a lift chair is often used. The lift chair, which can be referred to as a lift recliner or lifting recliner, is a type of home medical equipment that uses a motorized lifting system to raise the senior safely to their feet. Often closely resembling a regular recliner, the lift recliner offers the full functionality found in a standard Lazy-Boy Style sitting chair, with the added bonus that the footrest and backrest are electronically controlled. However, it is the lifting system located in the base of the chair which provides the most glaring difference between a lift chair and a regular recliner. The lift chairs lifting system, which is activated by an easy to use hand control, causes the entire device, user and all, to be raised slowly upwards. Once the lift recliner has been fully raised, the user can easily exit the chair in an upright standing position. This is not required though, as the position of the lift chair is such that even when it is fully raised, the user can comfortably and safely remain seated. 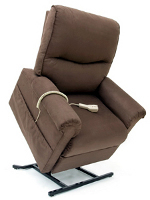 Lift recliners come in a variety of sizes, styles, and designs. So, it is very important to ensure that the senior is of the right physical proportions to use the lift chair. The users height and weight are the two mot important proportions to consider, as the distance that the lift chair raises is determined by the height of the user it is made for. That is to say, a lift chair designed for seniors who are 6 feet tall will rise considerably higher than one that is made for seniors who are 5 1/2 feet tall. The lift chairs weight capacity is also important, as if it is exceeded, there is a risk that the motor will burn out. Other measurements, such as the seats width and depth, are also very important and can greatly affect comfort and usability. A lift chair can be a tool that makes it much easier and safer for a senior to stand safely without outside assistance. They also are typically quite comfortable and are sure to quickly become the favorite sitting chair of the senior.